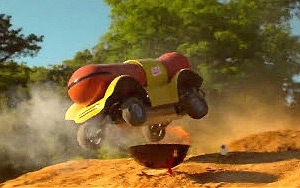 To mark National Hot Dog Day on July 23, Kraft's Oscar Mayer brand unveiled an all-terrain version of its famed Wienermobile, dubbed the Wiener Rover. The rover, a smaller, remote-controlled, battery-powered hot dog-shaped vehicle on heavy-duty tires, is not only able to navigate off-road terrain; unlike the Wienermobile, it can deliver actual hot dogs, warm and ready to eat. The rover's compartment can hold up to eight hot dogs, plus condiments. A video viewable on Oscar Mayer's YouTube and other social media channels shows the feisty rover in action. "We consistently hear that people are hungry for a hot dog after they see the Wienermobile, but we have never been able to offer them the deliciousness they desire," said Corey Rudd, senior associate brand manager at Oscar Mayer. "We developed the Wiener Rover to go where no Wienermobile has gone before, to surprise and delight our loyal fans at their local parks, beaches, festivals and beyond." Although the vehicle was debuted in decidedly not off-road New York City, it will be making appearances around the country in the coming weeks, reports Kraft.